Welcome to Meat Wednesday’s Live coverage of Survivor Series, the last of WWE’s “Big Four” PPVs of 2018. 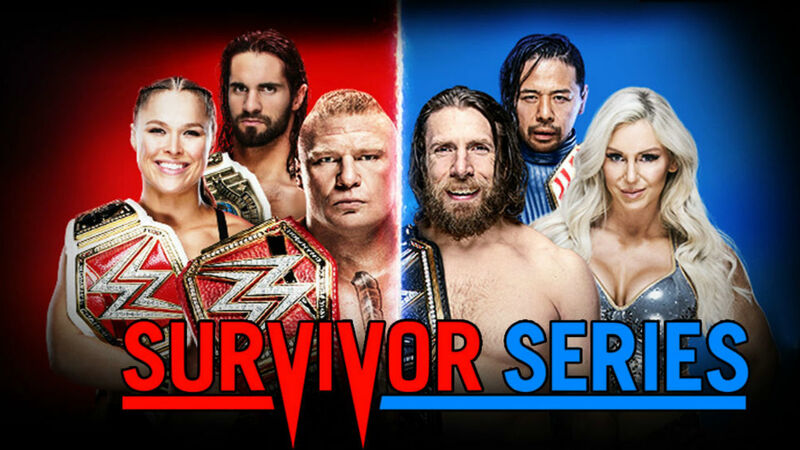 Emanating from the prestigious Staples Center in Los Angeles, CA, Survivor Series will play host to a bevy of Raw vs Smackdown matchups featuring Ronda Rousey vs Charlotte Flair, Brock Lesnar vs Daniel Bryan, and traditional 5 vs 5 elimination matches for the Men’s, Women’s, and Tag Team divisions. After a tremendous NXT Takeover: War Games II on Saturday, the pressure is once again on the main roster to match their developmental counterparts (as usual). Stay tuned for all the biggest moments and stories from this year’s Battle for Brand Supremacy. Team Smackdown wins after the last remaining team The Uso’s pin the Revival. -Tamina (R) eliminated by Carmella (SD) via roll up (4-4). -Carmella (SD) eliminated by Bayley(R) (3-3). -Mandy Rose (SD) eliminated by Sasha Banks(R) via submission, Banks Statement (3-2 Raw). -Bayley(R) and Sonya DeVille(SD) eliminated via count out (2-1 Raw). -Asuka is the last remaining woman for Smackdown against Sasha Banks and Nia Jax from Raw. -Sasha Banks(R) eliminated by Asuka(SD) via submission, Asuka Lock (1-1). -Team Raw wins when Asuka is eliminated by Sole Survivor Nia Jax. TEAM RAW takes a 1-0 lead. Seth Rollins wins via pinfall for Team Raw following the Curb Stomp. TEAM RAW takes a 2-0 lead. The Authors of Pain defeat the Bar via pinfall following a distraction in which Drake Maverick peed his pants after being attacked by Big Show. TEAM RAW takes a 3-0 lead. Buddy Murphy defeats Mustafi Ali to retain his Cruiserweight Championship. 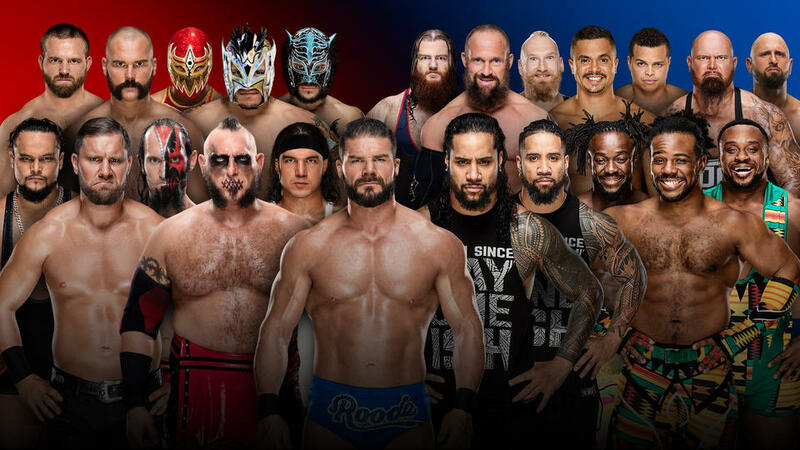 Team Raw (Captain: Baron Corbin; Bobby Lashley, Finn Balor, Dolph Ziggler, Drew McIntyre, Braun Strowman) vs Team Smackdown (Captain: The Miz; Shane McMahon, Jeff Hardy, Samoa Joe, Rey Mysterio). -Samoa Joe (SD) is eliminated by Drew McIntyre (R) via pinfall following a Claymore (5-4 Raw). -Shane-O hits a flying elbow from the top rope to put Strowman through an announce table. -Finn Balor(R) is eliminated by Rey Mysterio(SD) via pinfall (4-4). -Dolph Ziggler(R) is eliminated by Shane McMahon via pinfall following Coast to Coast (4-3 Smackdown). -Shane McMahon is swatted out of the air by Braun Strowman during a Coast to Coast attempt. -Jeff Hardy(SD) is eliminated by Braun Strowman(R) following a devastating powerslam (3-3). -The Miz is eliminated by Braun Strowman (3-1 Raw). Shane McMahon is the last remaining member of Team Smackdown. -Shane McMahon is eliminated by Braun Strowman. Team Raw wins with 3 remaining members: Braun Strowman, Bobby Lashley and Drew McIntyre. -Following the match Baron Corbin blindsides Braun Strowman before retreating up the ramp flanked by Lashley and McIntyre. -Very interesting booking throughout the entire match. Raw now takes a 4-0 lead over Smackdown. Although it is extremely disappointing that Becky Lynch was pulled from this match following injuries she suffered on Monday Night Raw, the silver lining in the situation is that Ronda Rousey vs Becky Lynch could end up headlining Wrestlemania 35 if WWE plays their cards right and are able to keep Lynch’s momentum rolling once she returns. Another perk is that many fans were initially expecting Rousey vs Flair to take place at next year’s Wrestlemania, so you can call it an early Christmas present that we get to see these two women square off so soon. After a great back and forth bout which saw neither woman able to get the best of the other, Charlotte suddenly snapped, attacking Rousey with a hellacious assault with a kendo stick, followed by chair shots. Rousey was left a bloody and battered mess in the ring. The LA crowd showered the ring with “Thank You Charlotte” chants as the Queen was finally escorted out by security. Lesnar begins the match by unloading on Bryan with a series of German and belly to belly suplexes. After a prolonged beating, Bryan, who entered the match as a heel, garnered enough sympathy to get the crowd on his side. An attempted F5 by Lesnar saw Bryan get tossed into the referee who happened to be standing nearby, allowing Bryan to strike Lesnar with a low blow and fight his way back into the match. A series of running knees were not enough to keep the Beast Incarnate down though, nor was Bryan’s last ditch effort at forcing Brock to tap out to the Yes Lock. Ultimately it was Lesnar who caught Bryan in mid-air and planted the Bearded Wonder with a final F5, picking up the victory for Team Raw and sealing the deal on a 6-0 clean sweep (excluding the Tag Team Elimination match from the kickoff show, which was won by Smackdown). From top to bottom, the booking of almost every match on the Survivor Series card was sure to leave fan’s scratching their heads. Whether it be the order or manner of some of the eliminations, or the outcomes of some of the bouts, or even the fact that Raw had a clean sweep over Smackdown, not much of what happened Sunday night in the Staples Center seemed to make any sense. It will be very interesting to see the steps WWE Creative takes on Monday’s Raw and Tuesday’s Smackdown to bring some resolution to all the confusion which Survivor Series chalked up.